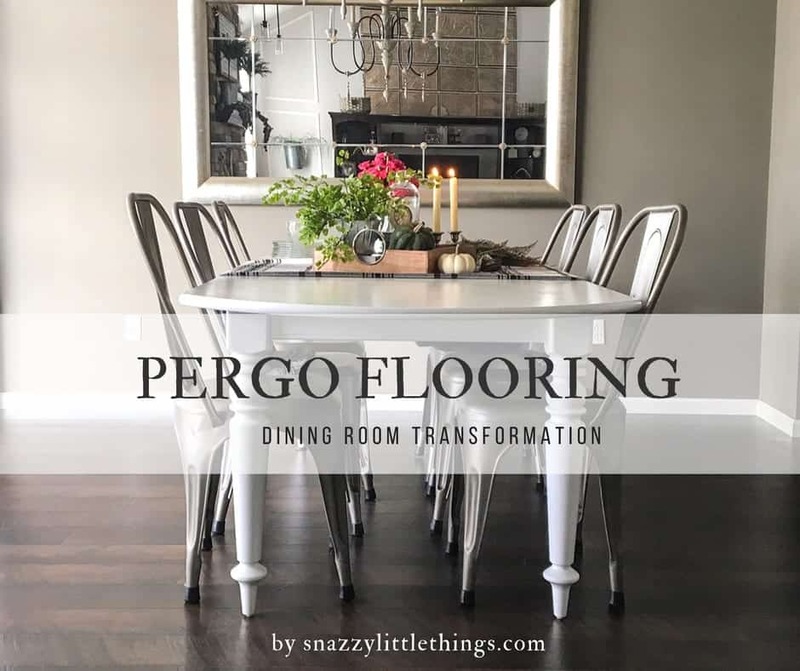 Today I’m sharing my Pergo flooring dining room reveal, along with a few before and “in-progress” photos thrown in. Can I just say?? This might go down as my most favorite “before and after” transformation on the blog. 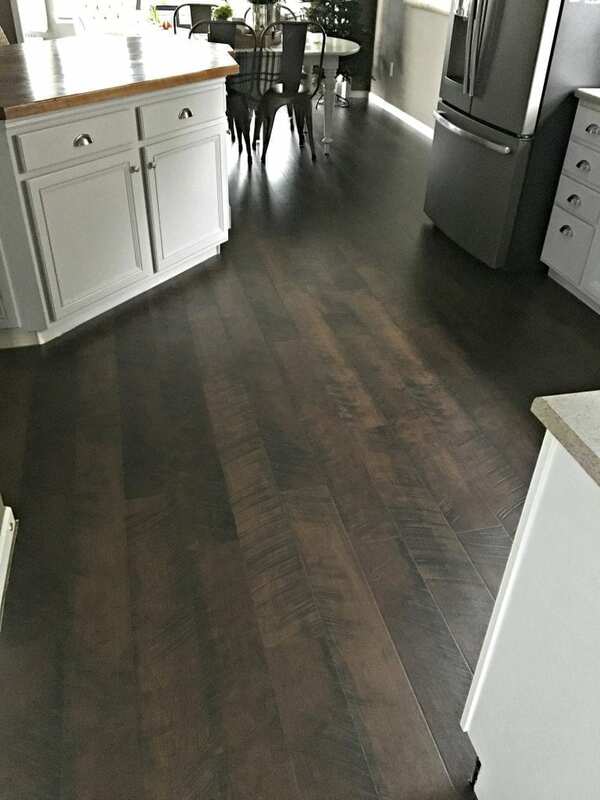 Last week we unveiled our kitchen floor as the first of many rooms that will go through this transformation. 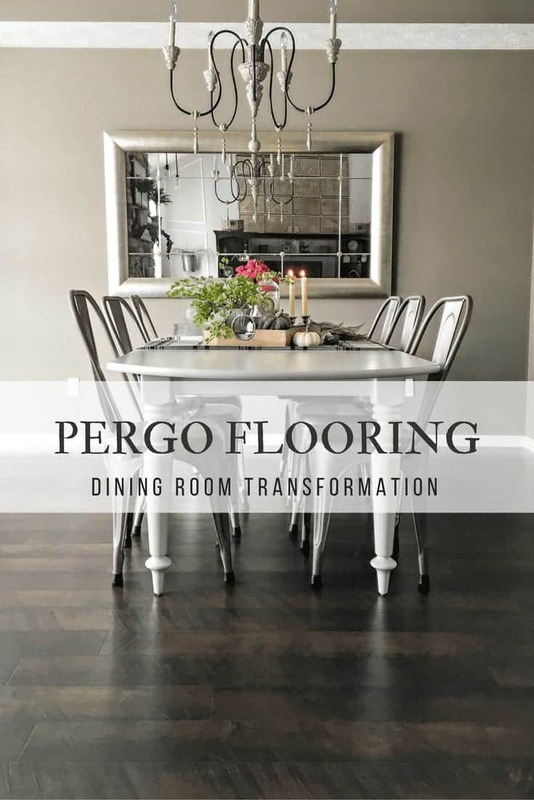 We still have about 3-4 more spaces to tackle as we continue replacing our entire first floor with Pergo. If you’re not a subscriber of my blog, be sure to sign up here to receive notifications each time I post. 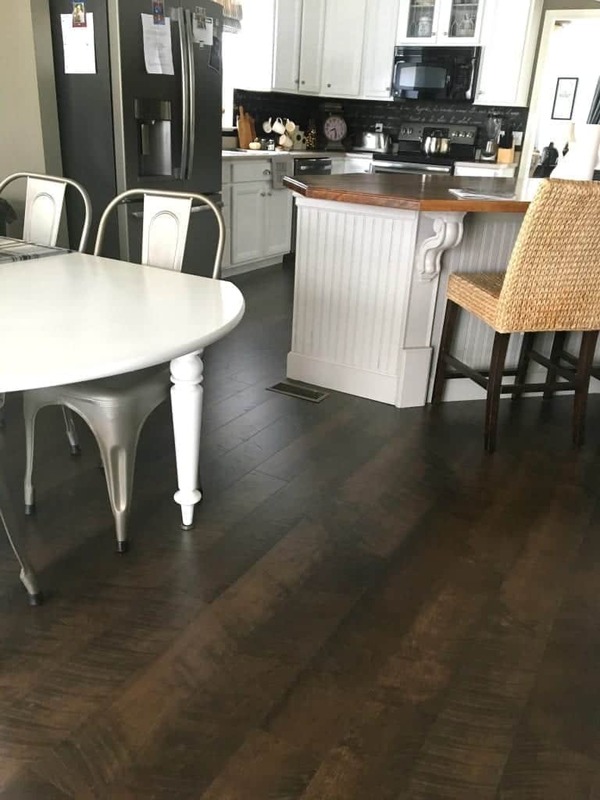 I have a feeling this new floor is going to inspire a brand new decorating style here at snazzy (and I suddenly like pink as witnessed in my centerpiece above!) No more all-neutral rooms for me! 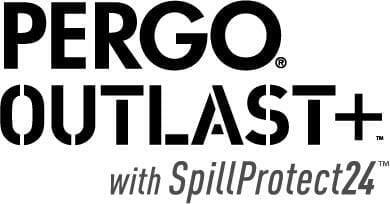 The flooring we chose is from Pergo’s new Outlast+ line, and the color is Molasses Maple. The dining room is rarely photographed here on my blog (often in the background but never a feature) and now I’ll never want to skip it again! We are in love with this new look. We’ve become minimalists as we’ve moved furniture and prepped each room for this project. I’ve decluttered quite a bit as I reassemble rooms. My entire approach to decorating seems to be changing, too. The red tone in our previous floor was always a struggle for me. As I decorated, adding “pops of color” didn’t always work…and I found myself over-decorating to tie it all together. The new Molasses Maple color works so much better in this space, and definitely amps up the drama. Brighter, colorful items will fit nicely in here. 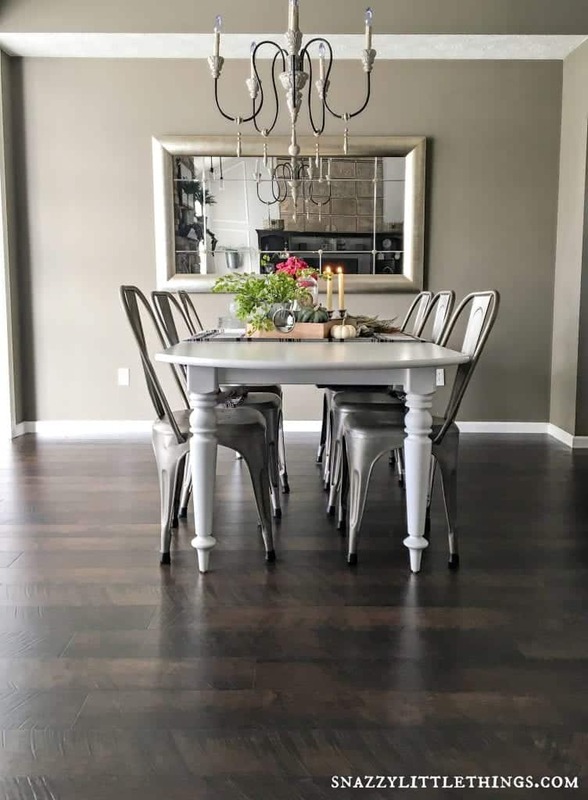 You probably caught a glimpse of the dining area during my kitchen reveal. 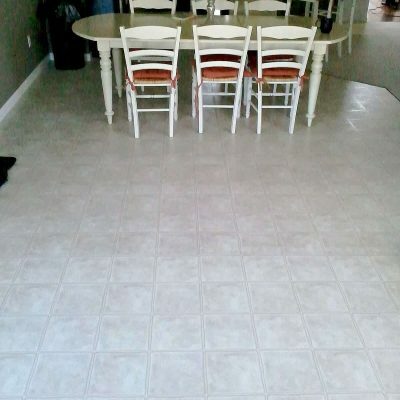 Our goal is to eliminate old carpet and install one, continuous floor with no transitions. 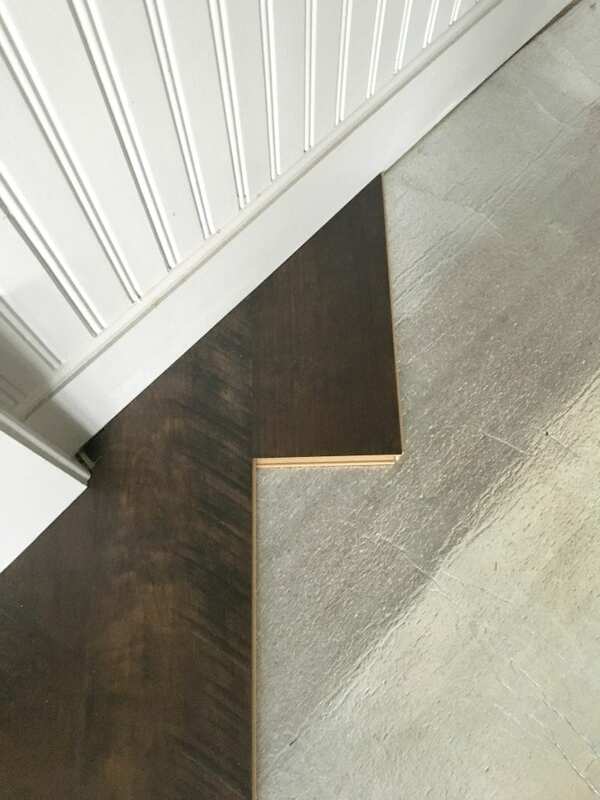 (A transition is that trim piece on the floor between rooms or different types of flooring). 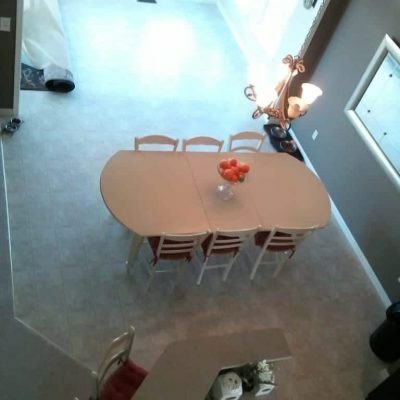 With an open concept home, Mark and I really wanted to make our rooms feel more open and connected, without transition pieces. Our previous floor was a combination of carpet and laminate, with lots of transitions, and it felt like a patchwork quilt. The photo below gives you a better understanding of how life looks when you’re taking on a major DIY. In progress, life can be a bit hectic. We laid floor boards from left-to-right as seen in the photo above, at which point we could lay flooring up to our island. 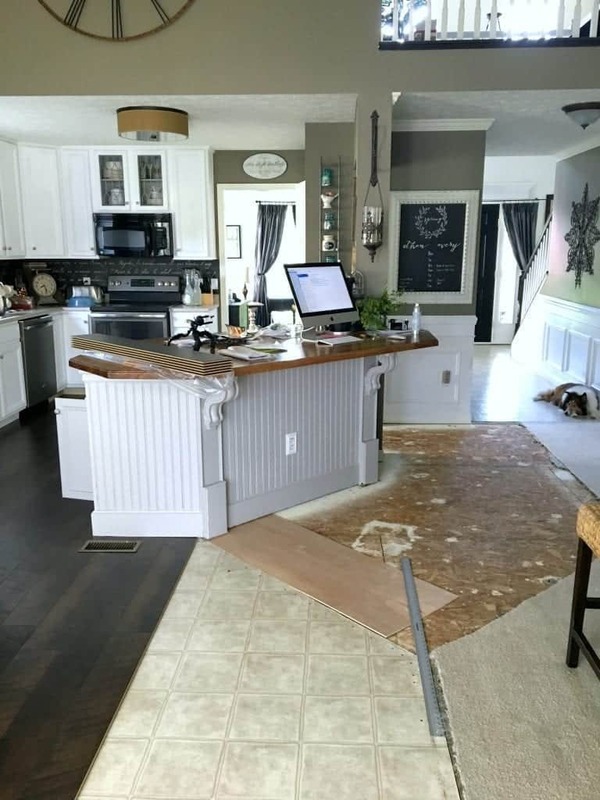 I’ve been tearing out our carpet, old transitions, and nails in partial sections. 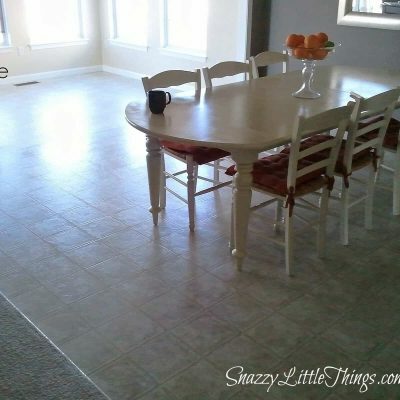 Doing it this way helped make our home more livable while taking a DIY of this magnitude. I have also been vacuuming constantly just to keep any dust contained (especially any that was under the old carpet). We relocated the older laminate (we are always reusing or upcycling our very own building materials). More on that in a future post.